Author(s): Fernanda Costas C. de Faria, Maria Eduarda Bento Leal, Paula Sabbo Bernardo, Paulo R.R. Costa, Raquel C. Maia. Laboratorio de Hemato- Oncologia Celular e Molecular, Programa de Hemato-Oncologia Molecular, Praca da Cruz Vermelha, 23, 6º andar. Instituto Nacional de Cancer (INCA), Rio de Janeiro, Brazil, CEP: 20230-130. Chronic myeloid leukemia (CML), a myeloproliferative disorder characterized by the BCR-ABL oncoprotein, presents its treatment based on tyrosine kinase inhibitors (TKIs), mainly imatinib. However, despite its clinical success, almost 30% of all CML patients demand alternative therapy. In this context, the development of drugs capable of overcoming TKIs resistance is imperative. The pterocarpanquinone-LQB-118 is a novel compound with anti-tumor effect in CML cells whose mechanism of action is being elucidated. Here, we demonstrate that in two CML cell lines exhibiting different biological characteristics, LQB-118 modulates NFκB subcellular localization, apparently independently of the AKT and MAPK pathways, partially inhibits proteasome activity, and alters the expression of microRNAs -9 and -21. 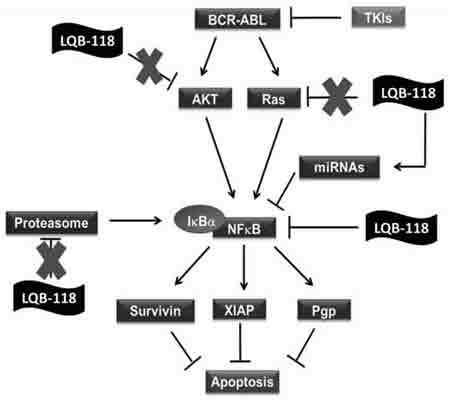 Keywords: Cancer, chronic myeloid leukemia, microRNA, multidrug resistance phenotype, NFκB, pterocarpanquinone-LQB-118. Affiliation:Laboratorio de Hemato- Oncologia Celular e Molecular, Programa de Hemato-Oncologia Molecular, Praca da Cruz Vermelha, 23, 6º andar. Instituto Nacional de Cancer (INCA), Rio de Janeiro, Brazil, CEP: 20230-130. Keywords:Cancer, chronic myeloid leukemia, microRNA, multidrug resistance phenotype, NFκB, pterocarpanquinone-LQB-118. Abstract:Chronic myeloid leukemia (CML), a myeloproliferative disorder characterized by the BCR-ABL oncoprotein, presents its treatment based on tyrosine kinase inhibitors (TKIs), mainly imatinib. However, despite its clinical success, almost 30% of all CML patients demand alternative therapy. In this context, the development of drugs capable of overcoming TKIs resistance is imperative. The pterocarpanquinone-LQB-118 is a novel compound with anti-tumor effect in CML cells whose mechanism of action is being elucidated. Here, we demonstrate that in two CML cell lines exhibiting different biological characteristics, LQB-118 modulates NFκB subcellular localization, apparently independently of the AKT and MAPK pathways, partially inhibits proteasome activity, and alters the expression of microRNAs -9 and -21.